In 2008, Buffalo�s oldest Bocce Club pizzeria celebrated 50 years in business�.at the same location! <?xml:namespace prefix = o ns = "urn:schemas-microsoft-com:office:office" /> It all started when Dino Pacciotti returned from the Second World War and began working as an accountant for General Mills. Dino, who was born in Buffalo to Italian immigrants in 1922, had spent his war service years as a court reporter at the Nuremberg trials. His travels led him to the homeland of his parents, where he renewed his experience with Italian traditions like Bocce ball, pizza pies and other dishes. Eager to get ahead after the war, Dino took a part-time job in addition to his day job at a bar on Hickory Street called Bocce's. Many of Buffalo's World War II veterans gathered there to participate in one of their favorite pastimes, Bocce ball. 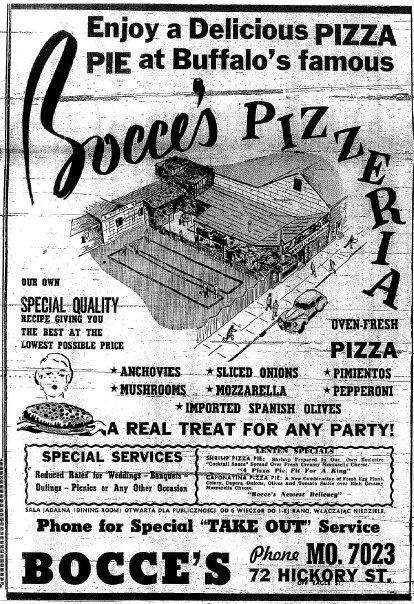 Dino and his brother-in-law, Michael Sacco, Sr., soon saw a future at Bocce's. They purchased the bar in 1946 and began serving sandwiches and their favorite Italian foods. The bar developed quite a following, in part due to the tasty pizza snacks Dino and Michael served. Full of the entrepreneurial spirit, in 1955 Dino introduced pizza packaged for take-out in corrugated boxes. Young families and college students welcomed the convenience, affordability and great taste. In 1958 the partners, Dino and Michael, moved to a larger location on Clinton Street, and in 1959 opened a second location on Bailey. 2) Program 360 Clinton Street, Buffalo in your GPS. 3) Arrive on time. Not too early. NEVER late. 4) Don't ask to many questions. 5) Have exact change. Tip. 6) Near your home, stop at a liquor store and grab a cheap bottle of Italian table wine. 7) Open box, take a strong wiff. Take a picture. Enjoy Buffalo history!